Regular Harpers and Financial Times contributor Barry C. Lynn paints a genuinely alarming picture: most of our public debates about globalization, competitiveness, creative destruction, and risky finance are nothing more than a cover for the widespread consolidation of power in nearly every imaginable sector of the American economy. 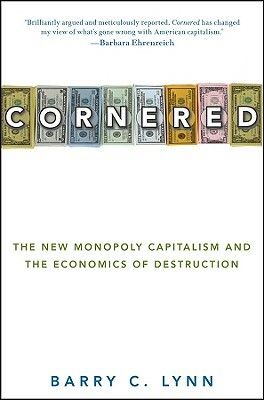 Cornered strips the camouflage from the secret world of twenty-first-century monopoliesneofeudalist empires whose sheer size, vast resources, and immense political power enable them to control virtually every major industry in America in an increasingly authoritarian manner. He reveals how these massive juggernauts, which would have been illegal just thirty years ago, came into being, how they have destroyed or devoured their competition, and how they collude with one another to maintain their power and create the illusion of open, competitive markets. The Obama administration has promised more aggressive enforcement on antitrust issues, but Lynn argues that they are missing the forest for the trees. For decades, the federal government has encouraged companies to buy one another up, outsource all their production, and make their profits by leveraging their market share. It will take more than a lawsuit or two to overthrow Americas corporatist oligarchy and restore a model of capitalism that protects our rights as property holders and citizens. Lynn is one of the vital new voices of his generation, and his work has been compared already to John Kenneth Galbraith and Peter Drucker. The Washington Post called Lynn's last bookon globalizationTom Friedman for grownups. Cornered is essential reading for anyone who cares about America and its future. Barry C. Lynn is a Senior Fellow at the New America Foundation. He has written for "Harper's Magazine," the "Financial Times," the "Harvard Business Review," and the "American Prospect," among others. He has appeared on National Public Radio, CNN's Lou Dobbs Tonight, Fox News, CBS, MSNBC, the BBC, and C-SPAN. He is the author of "End of the Line: The Rise and Coming Fall of the Global Corporation."